The walleye bite was hot on Lake Winnie over the Memorial Day weekend. The fish were found on shelf structure where the bottom went from 6-11 feet of water down to 18-24. A VMC mooneye jig, in any color, tipped with a spot-tailed or golden shiner was the terminal gear of choice. Try anything else, you caught perch. Constant cloud cover, temps in the mid-60's and a sustained SE wind of 15 knots kept the fish active ALL DAY. Most of the fish were females, thin and hungry. With the slot demanding anything over 17" must continue to swim, most fish measured 18-22" and were released. 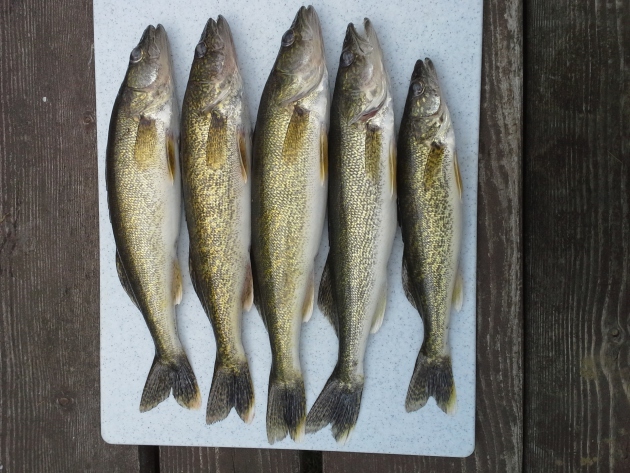 However, possession limits of 15-17" fish were easily filled. Boat traffic was minimal with maybe 15 other boats scattered around the SE quadrant of the lake. The West Winnie Campground featured a mosquito-free environment. Slot limits were unheard of when I first fished Minnesota in the 60's and 70's. Which begs the following questions: Is our state-wide fishery in that much worse shape than it was 30-40 years ago? Or are the DNR biologists smarter these days? Too much demand for the available supply? Or do the current-day electronics make it too easy to catch fish?